My mission as a full service photographer is to personally assist you in creating heirloom art pieces of your portraits to display proudly and enjoy in your home or office daily. I offer a variety of fine art wall decor as well as products to display on a table top or shelf. 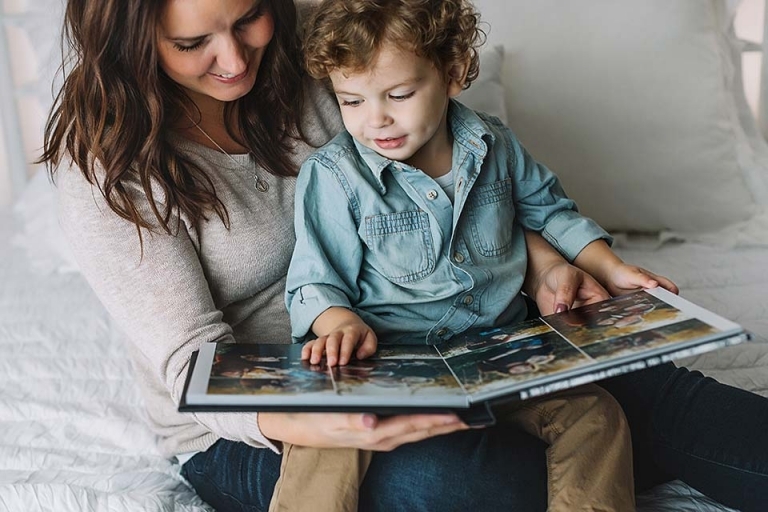 All of the products I offer are of archival quality, which means they will stand the test of time and be treasured heirlooms for your family to enjoy now and for many generations to come. 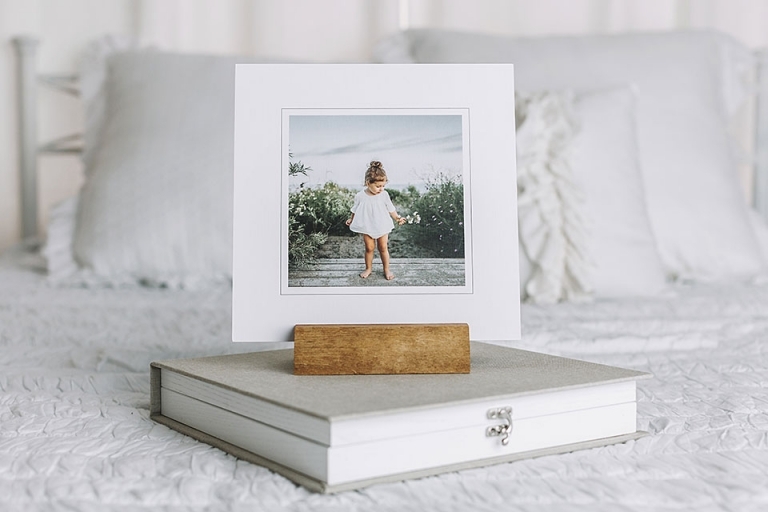 Heirloom Albums are locally handmade by experienced artisans. They feature your portraits on full, double paged panoramic spreads. Choose from a variety of cover options: linen, eco-leather, genuine leather or a photographic cover. 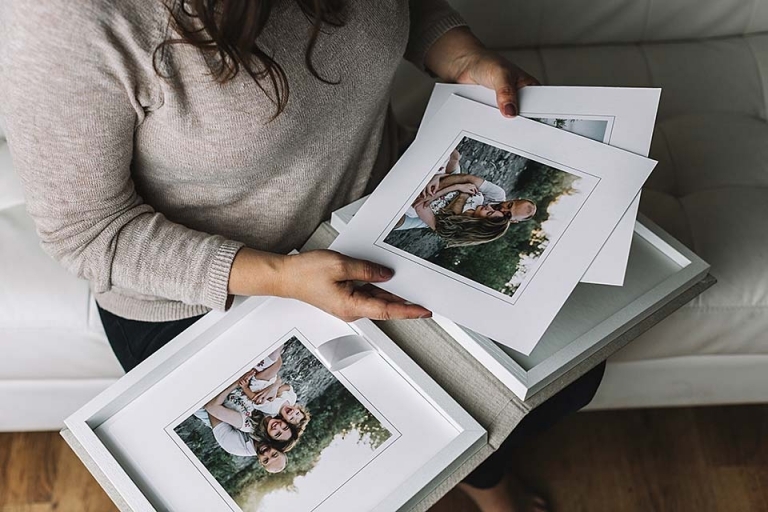 Your portraits are printed on the highest qualtiy Fuji Professional paper with a lustre or matte finish for durability and longevity. 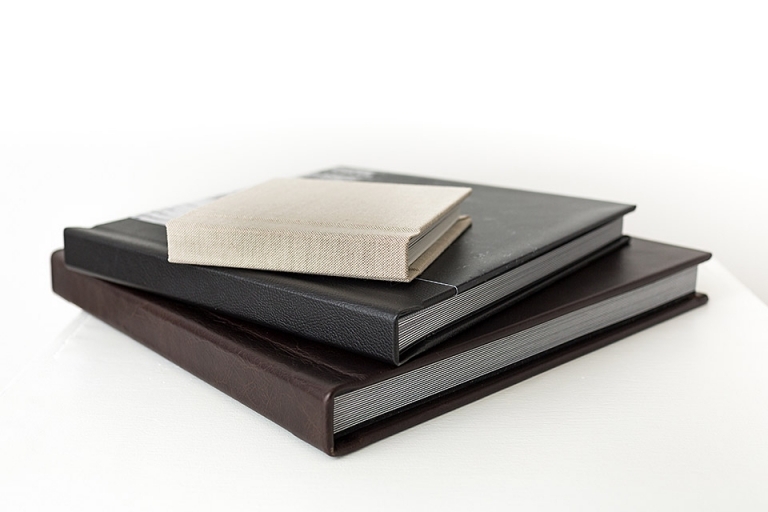 Our most popular sizes are 12"x12", 10"x10", and 8"x8". Other custom sizes available. Your album comes with the matching low-resolution digital files, perfect for email and social media sharing. 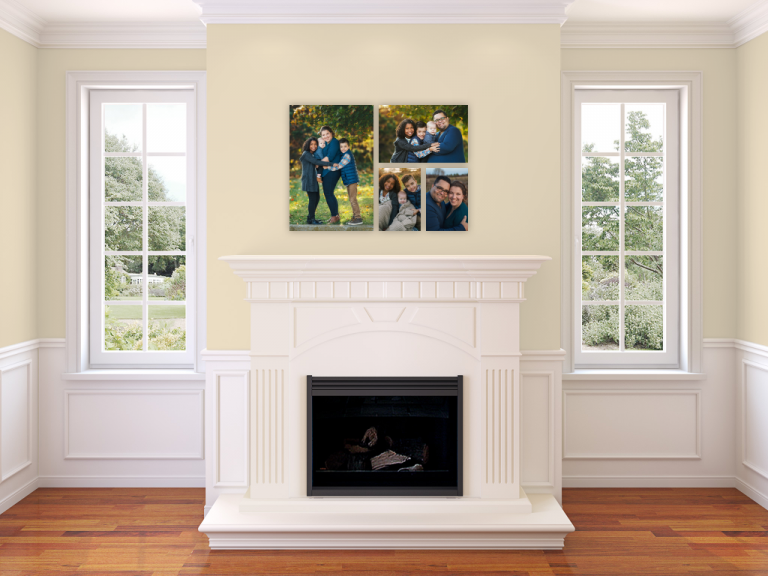 Wall portraits come in a varitey of different sizes. 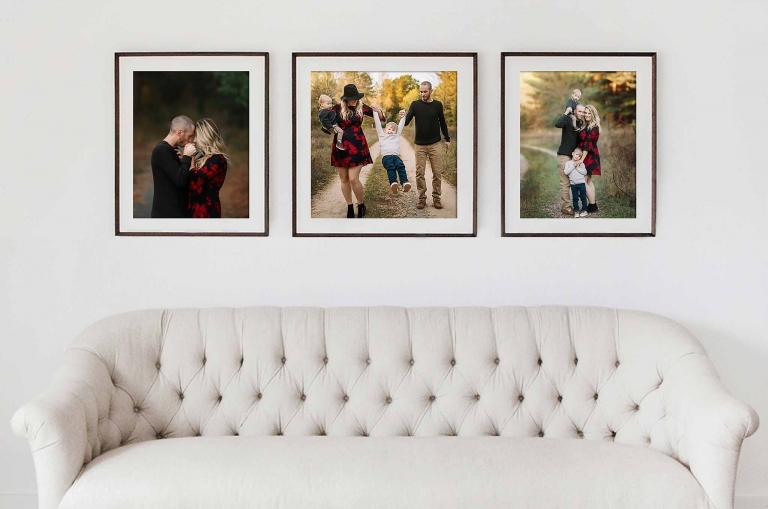 Wall portraits are professionally printed using the highest quality inks on archival paper, then matted or mounted on a thick styrene material to ensure your portratis will remain flat and wrinkle free over time. Your treasured portraits will be preserved with a lustre or matte finish and will stand the test of time, made to last for many generations. 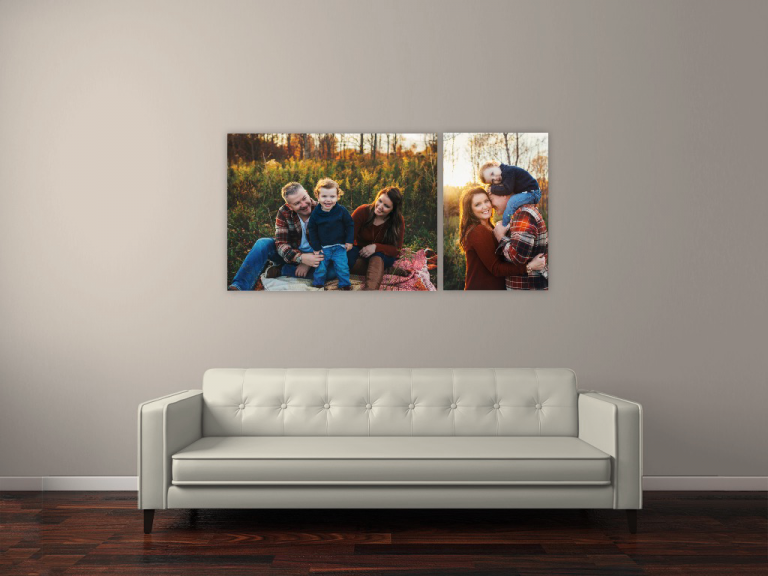 Each portrait comes with the matching high-resolution digital file with re-print permission, perfect for printing your own prints up to 11"x14" to give to family and friends or dispaly in your home or office. The files can also be used for email and social media sharing. An alternative to a traditional heirloom album, the linen keepsake box is handmade by local artisans. 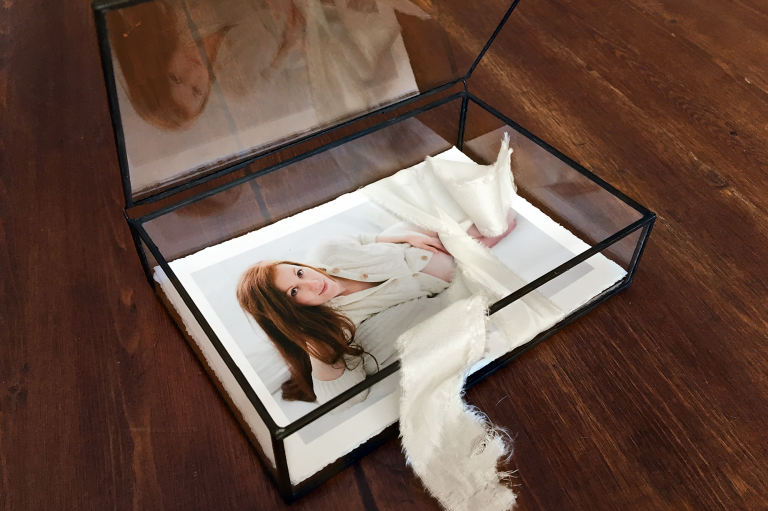 The keepsake box comes in your choice of coloured linen and features 10 beautifully mounted or matted portraits which are professionally printed on archival fine art paper using the highest quality inks. The portraits are finished with a lustre or matte spray for durability and longevity. 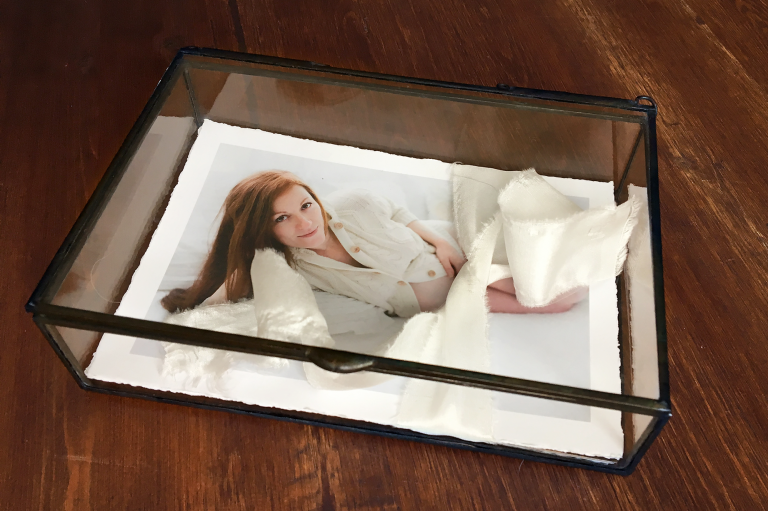 Your keepsake box comes with a rustic, handmade wooden stand to display a single portrait outside of the box. Our most popular sizes are 10"x10" and 5"x7". Other custom sizes available. 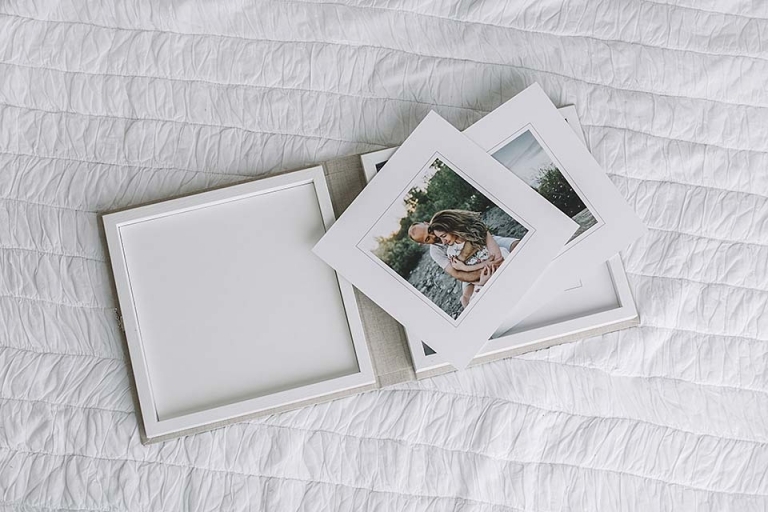 Your keepsake box comes with the matching low-resolution digital files, perfect for email and social media sharing. Wood floatmounts are a unique product offered by Melissa Maahs Photography. Once displayed on a wall, they give an illusion of being suspended in mid-air out from the wall. The floatmounts have bevelled edges and the edge colour can be finished in white, black, grey or brown. Floatmounts can be ordered in a grouping that fit together for a beautiful collage on your wall or they can be ordered as a stand alone art piece. Each portrait comes with the matching high-resolution digital file with re-print permission, perfect for printing your own prints up to 11x14 to give to family and friends or dispaly in your home or office. The files can also be used for email and social media sharing. The artisan glass box is handmade by an international artist. 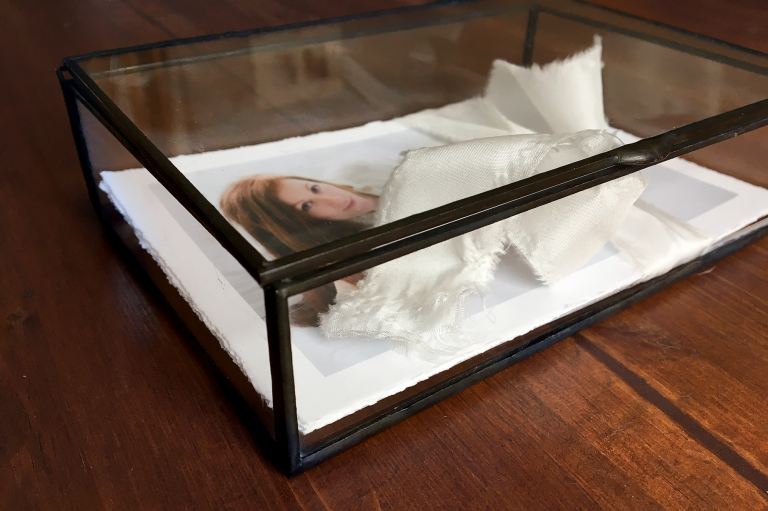 The glass box comes with 4x6 professional prints of every portrait from your gallery and can be beautifully displayed anywhere in your home or office.